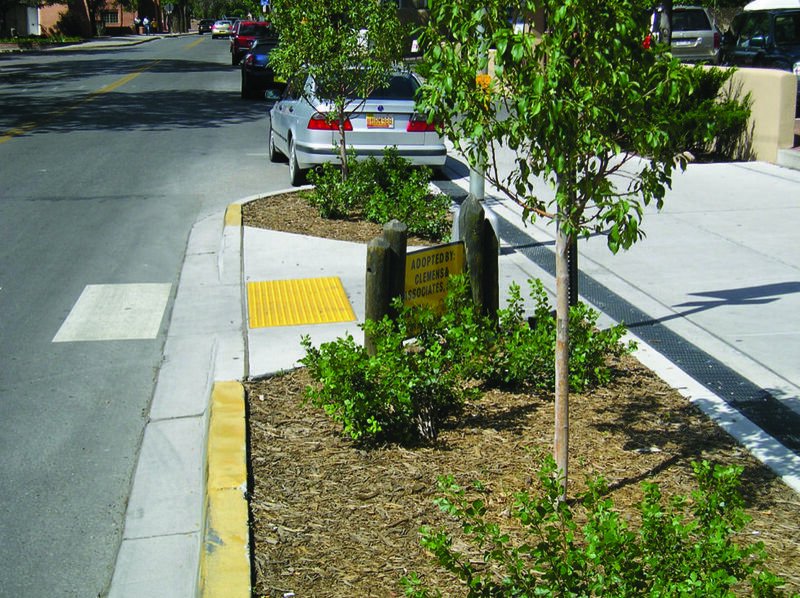 Curb extensions visually and physically narrow the roadway, creating safer and shorter crossings for pedestrians while increasing the available space for street furniture, benches, plantings, and street trees. 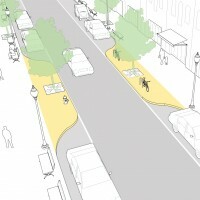 They may be implemented on downtown, neighborhood, and residential streets, large and small. 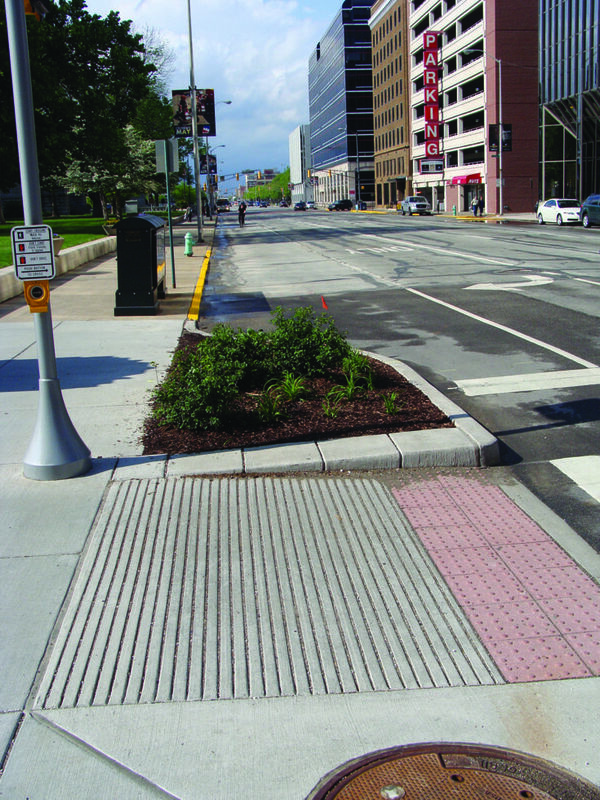 Curb extensions have multiple applications and may be segmented into various sub-categories, ranging from traffic calming to bus bulbs and midblock crossings. Curb extension is an umbrella term that encompasses several different treatments and applications. Midblock curb extensions, known as pinchpoints or chokers, which may include cut-throughs for bicyclists. Curb extensions used as gateways to minor streets known as neckdowns. 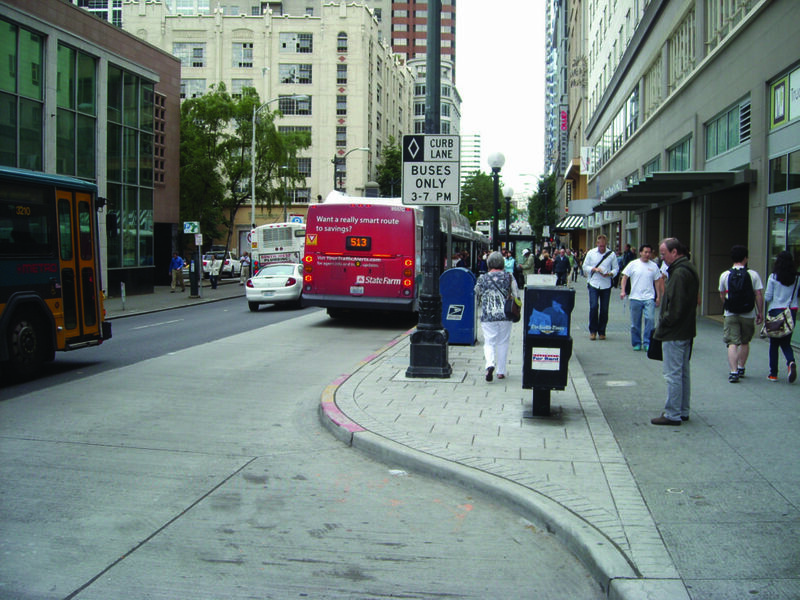 Offset curb extensions that force vehicles to move laterally, known as chicanes. Curb extensions at bus (or transit) stops, also known as bus bulbs. Conventional curb extensions, which are a recommended feature where there is on-street parking. 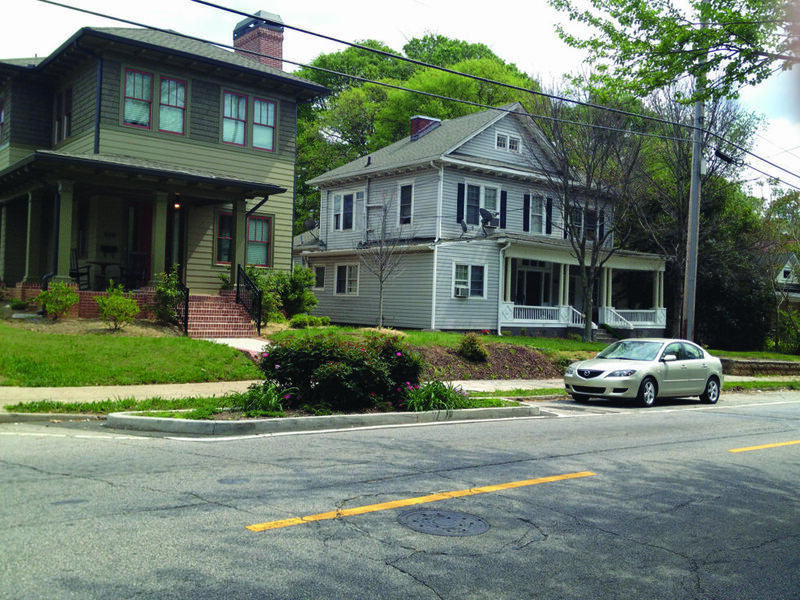 Curb extensions decrease the overall width of the roadway and can serve as a visual cue to drivers that they are entering a neighborhood street or area. Curb extensions tighten intersection curb radii and encourage slower turning speeds. 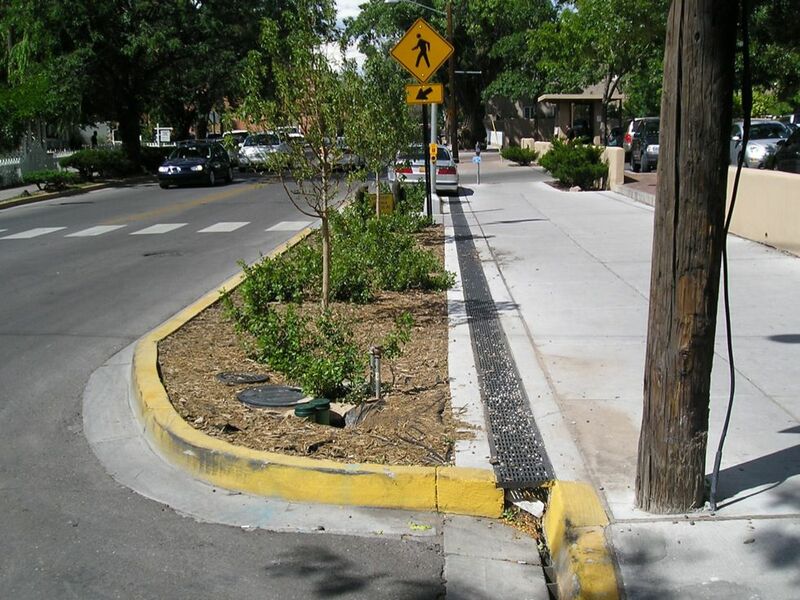 Where application of a curb extension adversely impacts drainage, curb extensions may be designed as edge islands with a 1–2-foot gap from the curb or a trench drain. 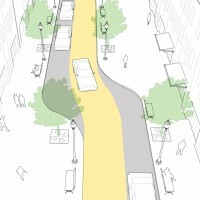 Curb extensions can be implemented using low-cost, interim materials. 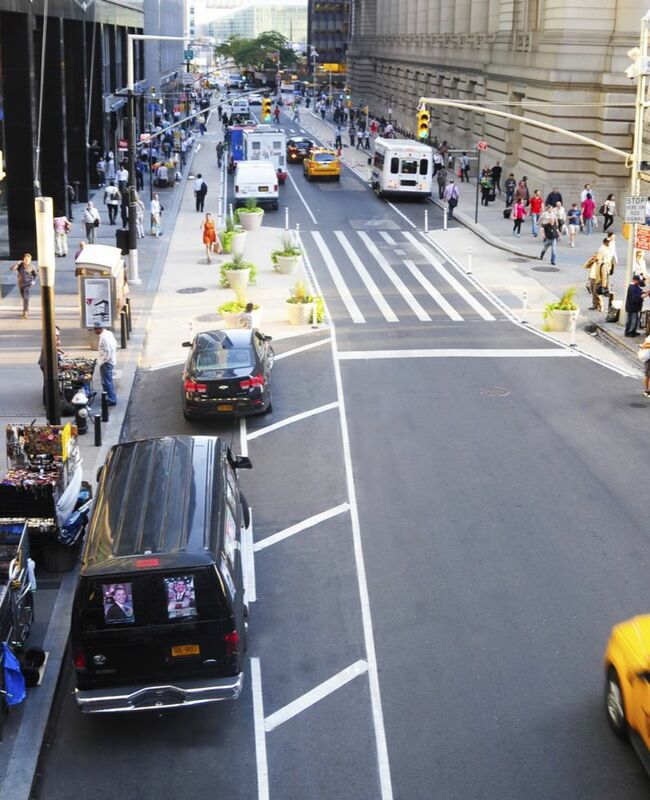 In such cases, curb extensions should be demarcated from the existing road- bed using temporary curbs, bollards, planters, or striping. Randal S. Johnson, Pedestrian Safety Impacts of Curb Extensions: A Case Study (Corvallis: Oregon State University, 2005). Relocation can be costly. The City of San Francisco estimates the expense of relocating a fire hydrant between $40,000– $70,000. Allowing hydrants to remain in place offers cost savings. NYC DOT recommends curb extensions in front of hydrants to guarantee access where illegal parking is an issue, thereby benefiting emergency services. 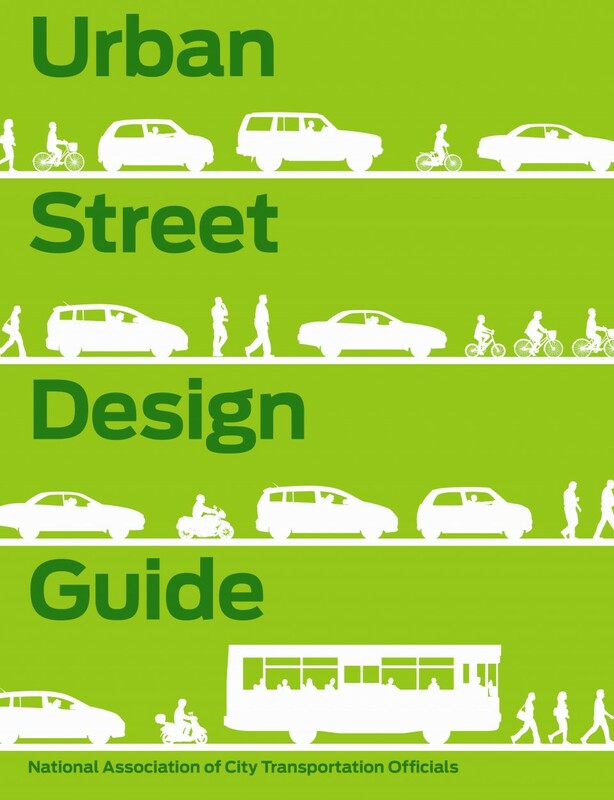 Street Design Manual (New York: New York City Department of Transportation, 2009), 65. 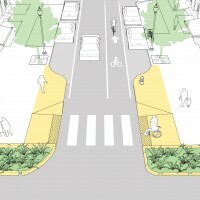 San Francisco Better Streets Plan (San Francisco, 2010). “Crossing Enhancements,” Walking Info, accessed June 3, 2013. 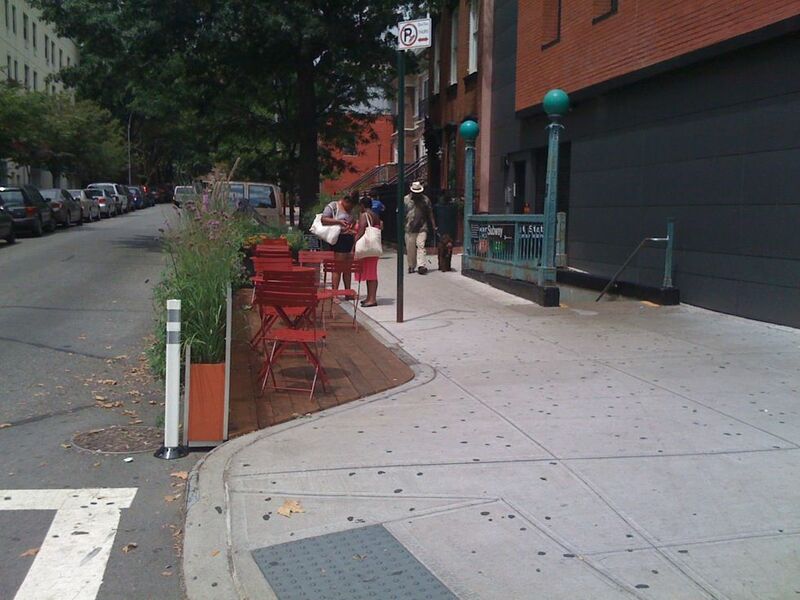 “Traffic Calming Design Guidelines,” New York City Department of Transportation, accessed June 3, 2013, http://www.nyc.gov/ html/dot/html/pedestrians/traffic-calming.shtml. 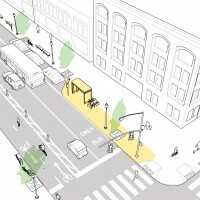 In San Francisco bus bays are being replaced with bus bulbs. Analysis shows that the bus bulbs increased vehicle and bus speeds between 7–46%. 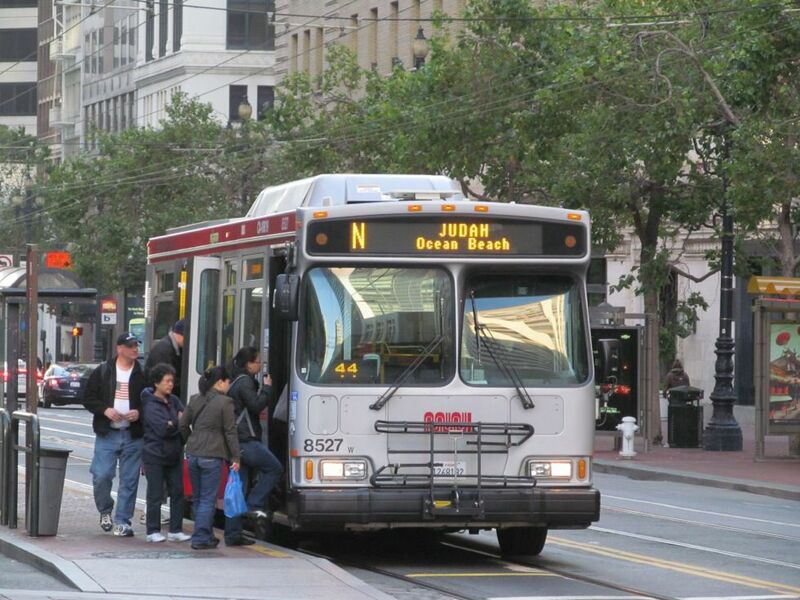 Experience in a variety of cities shows that bus bulbs combined with signal priority and automobile turn restrictions may significantly improve transit operating efficiency. Kay Fitzpatrick, Kevin M. Hall, Stephen Farnsworth, and Melisa D. Finley: TCRP Report 65: Evaluation of Bus Bulbs (Washington, D.C.: Transportation Research Board, 2001), 2. Johnson, Randal. “Pedestrian Safety Impacts of Curb Extensions: A Case Study.” Corvallis: Department of City, Construction, and Environmental Engineering, Oregon State University, 2005. New York City Department of Transportation. Street Design Manual. New York: 2009. Walking Info. “Crossing Enhancements.” Pedestrian and Bicycle Information Center, 1-6. New York City Department of Transportation. 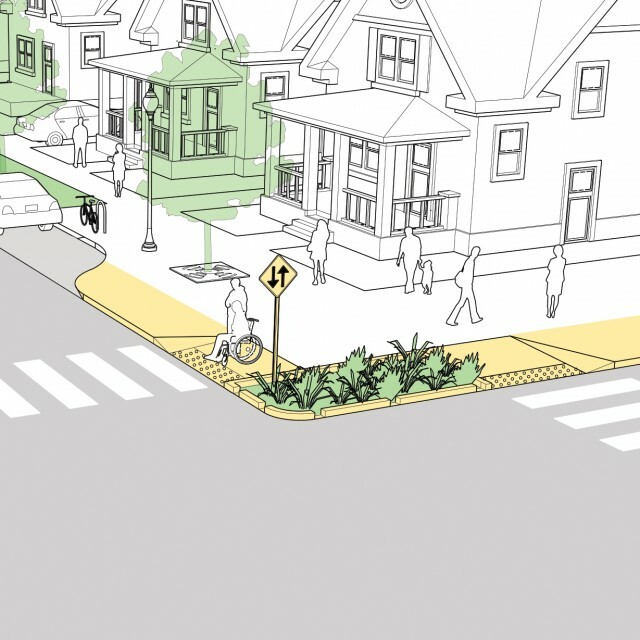 “Traffic Calming Design Guidelines.” Accessed June 3, 2013. References for Curb Extensions: 14 found.